The Lookout Mountain Parkway runs along the top of the 84 miles of Lookout Mountain. The Parkway spans three states, Tennessee, Georgia, and Alabama. There are a variety of things to see and do along the parkway, from Ruby Falls near Chattanooga, Tennessee in the north to Noccalula Falls in Gadsden in the south. Many of the places to visit are either free or very inexpensive. And the scenery can't be beat. Cost: There is no cost to drive on the parkway. Several of the attractions along the parkway are also free, but others cost money. 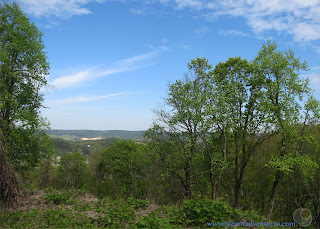 My family drove on the Lookout Mountain Parkway at least a little bit during each day of our 5 day road trip to the Lookout Mountain area of Alabama in April of 2016. Usually we drove on it as we were travelling to and from our campsite at DeSoto State Park. Lookout Mountain stretches 84 miles from Chattanooga, Tennessee in the north to Gadsden, Alabama in the south. 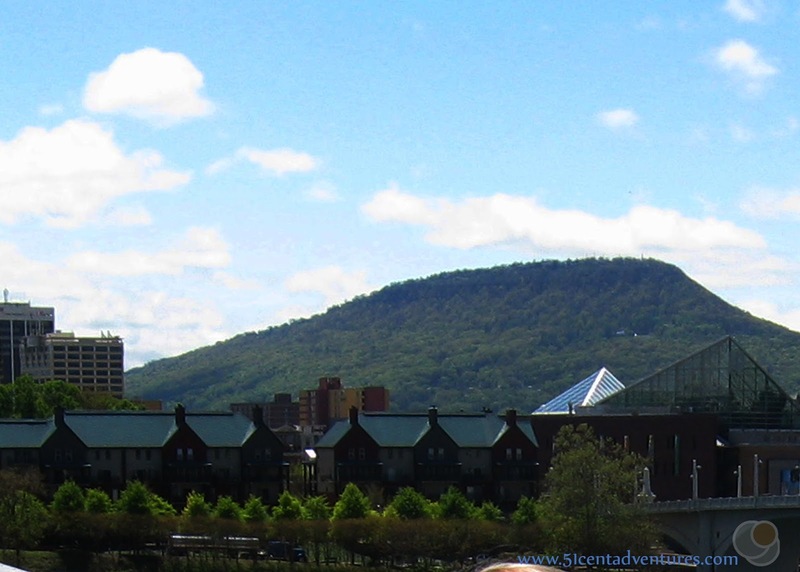 The mountain is most often associated with Chattanooga, but a larger part of the of the mountain is located in Georgia, and most of the mountain is located in Alabama. Lookout Mountain is a low mountain - it's highest point is 2,393 feet near the aptly named High Point, Georgia. 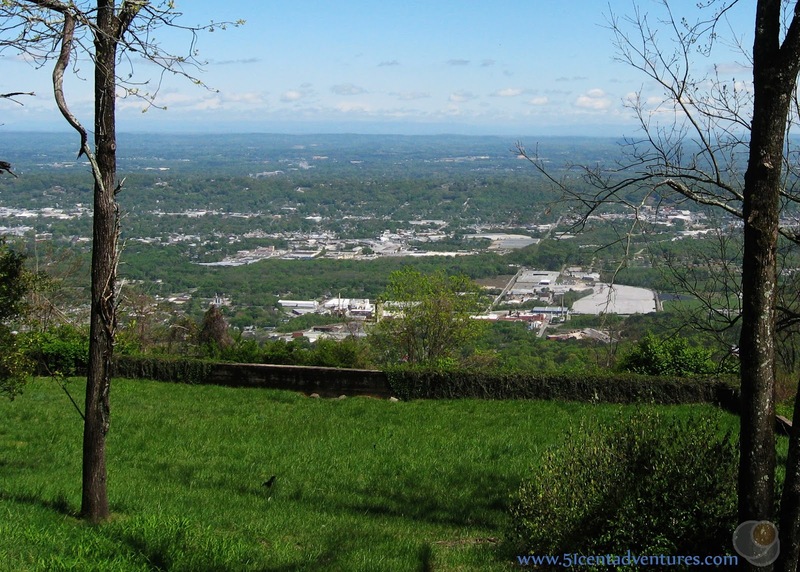 The Lookout Mountain Parkway is a series of roads that span the top of Lookout Mountain and make it possible to travel across the top of the mountain from Chattanooga to Gadsden. Throughout our 5 day road trip we drove on the entire parkway. And I learned a few things about the mountain. The Lookout Mountain Parkway was not how I expected it would be. I expected to be driving on a single road on the very top of the mountain. I assumed there to be many view points where my family could gaze out on the scenery below the mountain. I thought the whole mountain would be a remote wilderness. I imagined everything would be very pretty. I was right about one thing. The scenery was very pretty. But everything else was completely different from what I imagined. Here are some of the things I observed. 1. It wasn't all one road. The parkway is made up of several state highways that are inter-connected. Certain sections of the roads are designated as part of the "Lookout Mountain Parkway." The parkway includes parts of Highways 89, 117, 136, 157, 176, and 189. The different highway numbers are due in part to the parkway crossing over state boundaries, but even within each state the parkway includes several different highways. This made it kind of hard to know if we were on the parkway or not. It was also hard because there weren't very many signs that let you know when you were on the parkway, or how to get back onto it if you happened to get off. 2. There were hardly any "Lookouts" open to the public. For being called Lookout Mountain there weren't a lot of places we could actually lookout while standing on the mountain. Sure there were plenty of good view points, but they were all privately owned by homeowners. The actual Lookout Mountain Parkway was built on the middle of the mountain and so we'd drive by all the lovely homes that sat on the brow of the mountain. On the occasional times when we would drive near the edge of the mountain there were so many trees lining the road that we couldn't get a decent view. Most of the time it was hard to remember we were on top of a mountain while we were driving on the parkway. 3. There are homes all over the mountain. Sure there are some remote areas, but a great deal of Lookout Mountain is made up of prime real estate. Many people have built their dream homes on top of the mountain - preferably in a place with view. There was an especially nice neighborhood on top of the mountain near Chattanooga. Even through the Lookout Mountain Parkway wasn't what I expected that doesn't mean it was a waste of time. There are plenty of interesting things to see and do along the parkway. Let me tell you about a few of them. We'll start in the north in Chattanooga and work our way south. 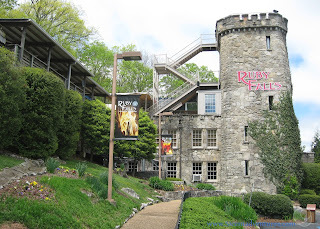 Ruby Falls is located inside of Lookout Mountain under 1,120 feet of rock. The entrance to the Ruby Falls cave is located about 1/3 of the way up the north face of Lookout Mountain. An elevator takes you down 260 feet. Then you walk about 1/2 to see the spectacular 145 foot waterfall. Cave Tours cost $19.95 for an adult and $11.95 for a child ages 3-12. 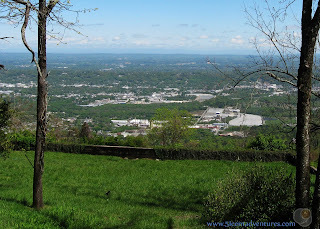 Point Park is located at the very northern most part of the top of Lookout Mountain. This is part of the Chickamauga and Chattanooga Military Park operated by the National Park Service. In addition to getting one of the best views of the Tennessee River Valley you'll also learn about this area's importance in the Civil War. The cost to enter the park is only $5 per adult and free for anyone under the age of 17. The Incline Railway takes you straight up the steepest side of Lookout Mountain. You get a great view of the area during the 1/2 mile accent. A round trip ticket costs $15 for an adult and $7 for a child ages 3-12. 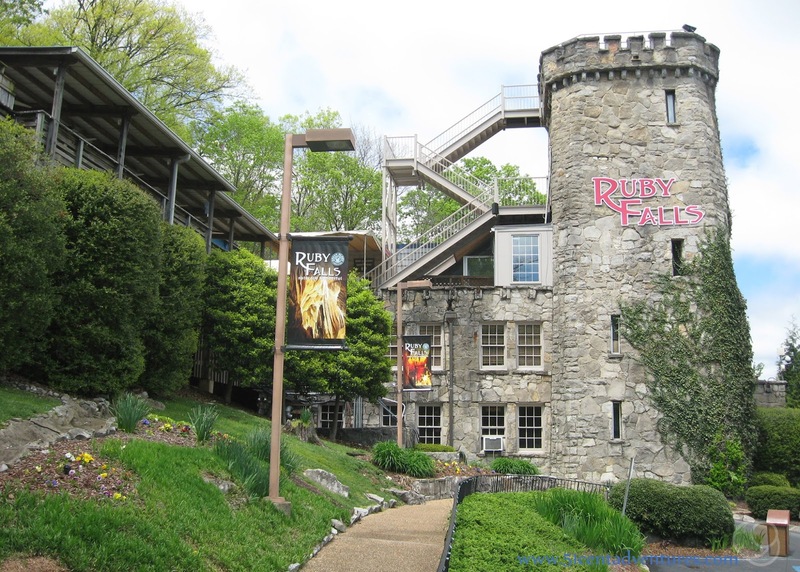 Rock City is located on top of Lookout Mountain about 5 miles away from Ruby Falls. Rock City has viewpoints and gardens built along a path. It boasts at view that allows you to see seven states, however many people have pointed out that the curvature of the earth would limit you to really only seeing 5 states. Admission to Rock City costs $19.95 for an adult and $11.95 for a child ages 3-12. 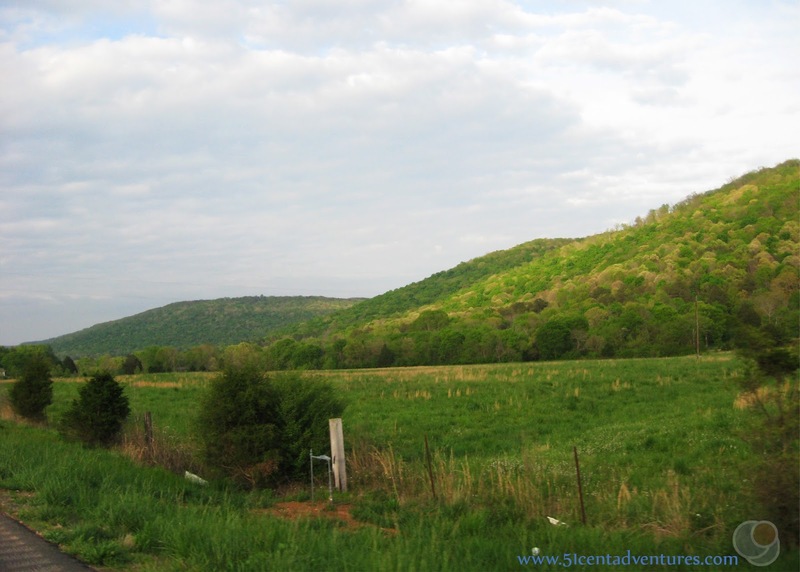 This state park straddles a deep gorge cut into Lookout Mountain by Sitton Gulch Creek. There are numerous hiking trails, but some of the best scenery is apparently located just a short distance from the main picnic area. Steep staircases take you down to the canyon bottom. There are even two waterfalls within the park. This park only costs $5 for parking. You can also reserve campsites and cabins at this State Park. And for some strange reason my family didn't visit this park. I'm mentally kicking myself for passing this place up. At the time I think my family was just too tired from our adventures in Chattanooga to think about doing anything in this park. But I have some serious regrets from that decision. It was only $5. What were we thinking when we decided not to even check this place out? 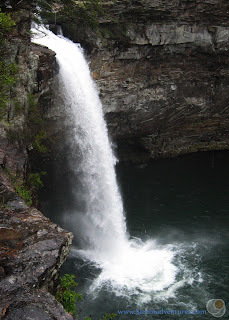 The park is located on top of Lookout Mountain about 9 miles northeast of Fort Payne, Alabama. 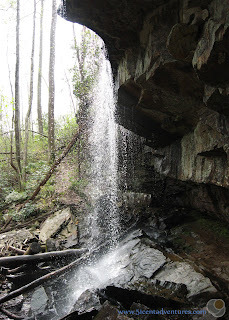 Waterfalls are the key feature of DeSoto State Park. There are many small falls located along the park's many hiking trails. 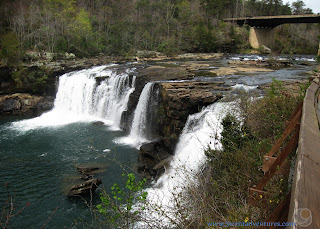 Most of these smaller falls are located within a few feet of the trail heads so they are easy to find. DeSoto State Park is free to visit. Though there is a $3 fee for the day use picnic area. The park shares a name with DeSoto Falls, a spectacular 107 foot waterfall located less than 6 miles north of the main part of the park. The Little River is the only river to flow entirely on top of a mountain. That's pretty neat in and of itself, but the canyon that the river has carved in the middle of Lookout Mountain is stunningly beautiful. The Lookout Mountain Parkway runs along the side of the canyon. And guess what? There are actually lots of areas where you can stop and lookout over the spectacular scenery. There is even a waterfall that is located right next to Highway 35. There is an easy walkway down to the observation points. 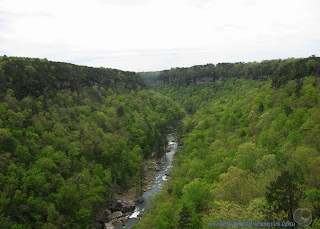 All of the Little River Canyon National Preserve is free to visit. Lookout Mountain ends (or begins depending on how to look at it) in Gadsden, Alabama. And the Lookout Mountain Parkway ends here as well. This section of the parkway is also known as Tabor Road. That road is located just a few feet away from Noccalula Falls Park which is home to the beautiful Noccalula Falls. The waterfall itself is free to visit. 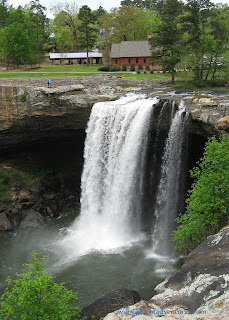 However, if you want you can go inside Noccalula Falls Park and enjoy the many things to do there. The park contains a small zoo, a pioneer town with historic buildings, interesting rock features, a botanical garden, a trail down to the large alcove behind the waterfall, and my personal favorite - a small train offering unlimited train rides. All this costs only $6 for adults and $3 for children over 4. Well there you have it. 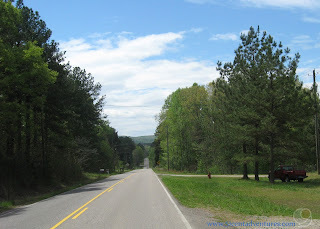 A good description of what to expect and what to see when you drive on the Lookout Mountain Parkway in Alabama, Georgia, and Tennessee. Recommendation: The Lookout Mountain Parkway has plenty to offer anyone who loves nature. From waterfalls to caves to beautiful scenery there is something for just about everyone. If you will be anywhere near the Lookout Mountain area you should plan to visit at least one thing that I've mentioned on this list. Directions: There are many ways to access the Lookout Mountain Parkway. The trickiest part is making sure that you stay on the parkway once you find it. Honestly, the whole thing needs better signs. 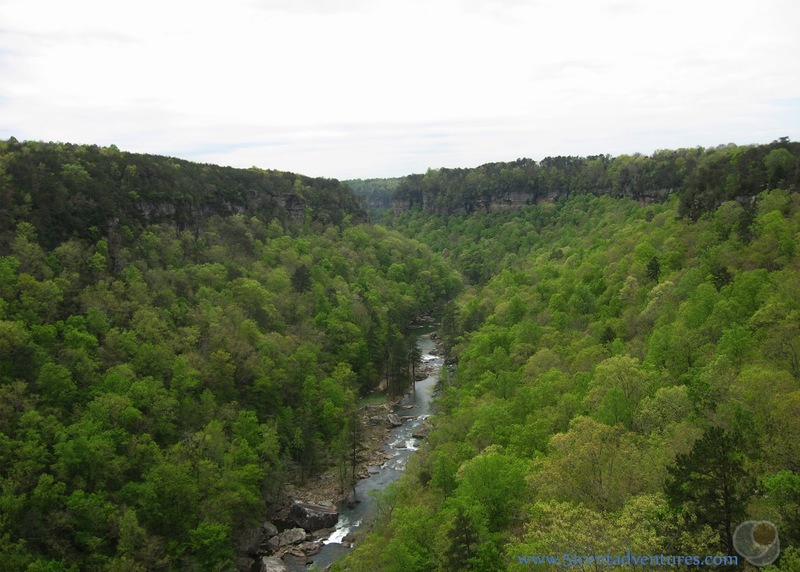 Next Stop: We'll take a more in-depth look at what it's like to visit the Little River Canyon National Preserve. Thank you for the information. I'm moving across the country and I'm trying to stop along the way and see a few things. Your post helped me make a very important decision on how to spend my time.